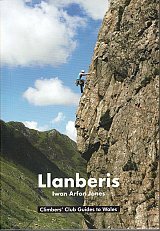 For this, the 6th edition of Llanberis, the text has been comprehensively updated, with details of over 50 new routes climbed since the last guide and revised assessments of the popular classics where necessary. Iwan Jones was author of the 2003 guide and co-author of its 1993 predecessor. He has now been involved in over a hundred first ascents in the Pass, and he has continued his efforts to make sure that the correct local names are given to all the crags. The resulting changes, as well as the origins of various crag names, are explained in tinted text boxes. One remarkable product of Iwan's historical research is the discovery that the name Bryant's Gully has been given to the wrong gully for the last 60 years or so. A two page glossary of climbing terms in Welsh has been given, both to aid climbers whose first language is Welsh and also to promote an appreciation of the Welsh language among English speakers.